​To schedule a boarding appointment give us a call at 731-644-9933! Our medium sized stainless steel kennels are approximately 2.5 ft deep by 3 ft wide and can accomodate a pet up to 40lbs. Our large stainless steel kennels are approximately 2.5 ft deep by 4 ft wide and can accomodate a pet up to 50lbs. 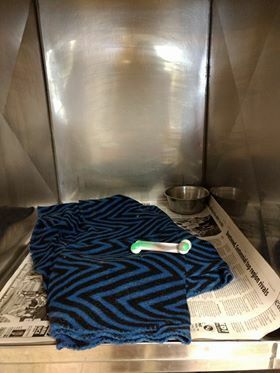 We always offer cozy blankets, toys and free choice water in their kennel. It is our goal to keep your pet as comfortable and content as possible during their stay with us. 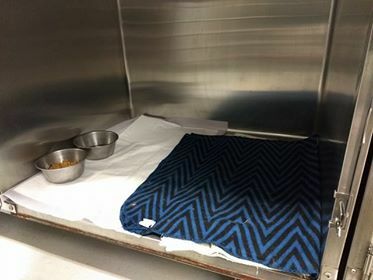 It is our goal to keep pets in the largest kennel possible while boarding. If we have large kennel space available, your small dog would be boarded in a large kennel as long as they seem comfortable. If you would like your small dog boarded in a large run only (see below) we are more than happy to accomodate you. Please give us a call as far in advance as possible to reserve your pet's spot. Space is limited. 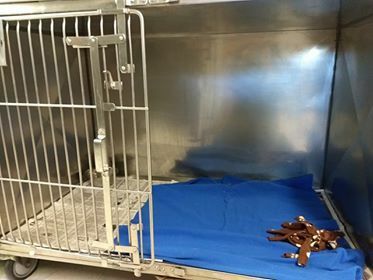 Pictured above is an example of one of our typical small stainless steel kennel set ups. Pictured above is an example of one of our typical large stainless steel kennel set ups. 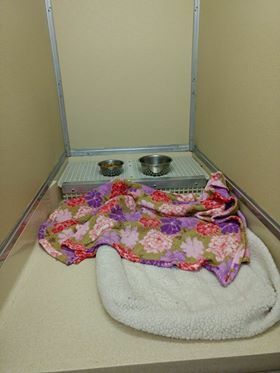 Pictured above is an example of one of our typical medium stainless kennel set ups. Our large runs are approximately 5ft deep by 3ft wide with a removable grate in the back that can be taken out to accommodate giant breed dogs. If you would like your small dog boarded in a large run only we are more than happy to accomodate you. Please give us a call as far in advance as possible to reserve your pet's spot. Large run reservations are not guaranteed as space is limited. Pictured above is our fenced in yard where your pet will take their potty breaks during their stay. As you can see we have a very large yard, 6 foot chain link fence with plenty of shade and a mixture of grass and gravel. Dog's are always supervised during potty breaks. Our cat kennels vary in size and can accommodate all sizes from tiny kittens to large adult cats. We always provide free-choice water bowls, litter boxes, comfy bedding and cardboard hiding boxes. We find having multiple resting places in their kennels helps cats to feel safer and more content during their stay. As with all boarding pets, we strive to keep your cat in the largest kennel possible with safety and comfort being the top priorities. 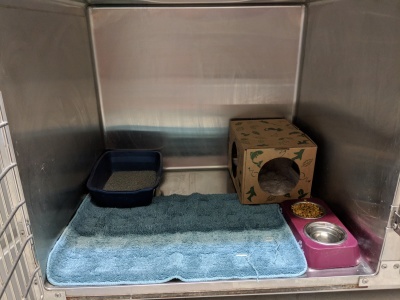 Pictured above is a typical cat kennel set up.